Where burial habits were concerned, the inhabitants of prehistoric Epirus had few options. 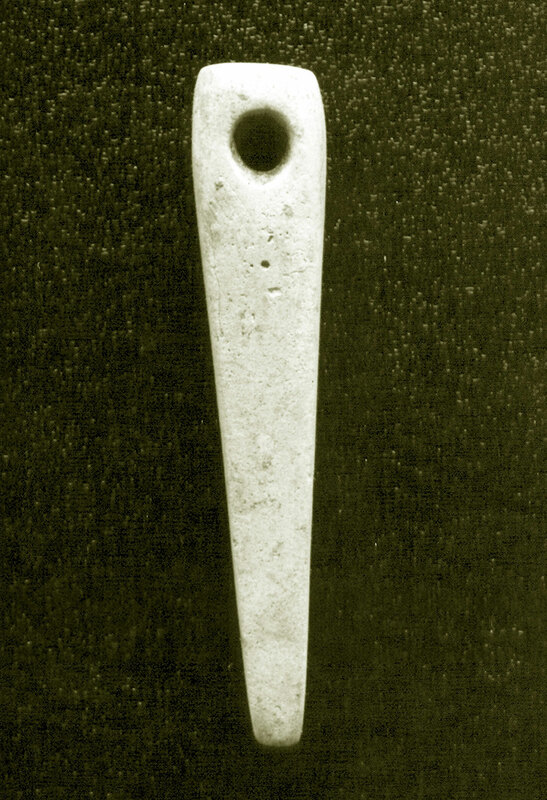 The simple cist grave (note 1) was predominant, encased in the earth of the region, in congruence with the harsh way of living at that time. Indicative of the area’s geology is the absence of the characteristic for the Mycenaean world rock-cut chamber tombs, chiselled in the soft sedimentary rock, more frequently to be found further south in Greece. The only tholos tomb known to us from Kiperi in Parga must be regarded as an imported Mycenaean practice. Burial gifts usually consist of clay vases, bronze weapons or jewellery and other small artifacts made of various materials. These were functional objects, which often had been used by the deceased in his or her daily life. Alternatively, they were objects specifically fabricated to symbolically accompany the deceased in their afterlife. Do these offerings reflect the individual’s true essence, when they are personal belongings, or do they perhaps express an imaginary picture of the living? The distinction is unclear, owing to the lack of anthropological studies, analyzing skeletal remains in Epirus. We will, therefore, confine ourselves to the description of such finds. Four cist graves were found at Elafotopos in Ioannina (note 2), while sherds of handmade pottery located in the same area indicate the existence of a settlement. The burial gifts were handmade semi-globular cups, a bronze curved knife, bronze spiral bracelets and rings, beads made of various materials and a golden sheet. The first grave was the richest one, while the fourth was found empty. In nearby Kalpaki (note 3) a group of four more cist graves were found, forming a small cemetery. The first grave was a man’s burial and contained a clay pot, a bronze dagger, a bronze spearhead and a bronze curved knife, while the fourth grave contained two skeletons with two clay vases, bronze jewellery and beads made of various materials. The second, a child grave, had no offerings and the third one was poorly provided with a vase and a bracelet. In neighbouring Mazaraki (note 4) a cist grave containing three skeletons was found with wealthy burial gifts. These included five Mycenaean wheelmade and local handmade vessels, a bronze sword and a dagger, three bronze spearheads, some bronze jewellery, beads made of various materials and a perforated whetstone-pendant (fig. 1). In the grave filling sherds of handmade pottery were also found, as well as the stem of a Mycenaean kylix. The finds yielded by two cist graves at Kastritsa in Ioannina were a stirrup jar and a bronze dagger. The afore-mentioned four small clusters of graves were dated by their finds as belonging to the Late Helladic IIIB-C period. A cist grave at Romano (note 5) with a female burial and bronze jewellery dates to the 11th century BC. Lastly, a similar grave at the Nekyomanteion by Acheron contained Mycenaean sherds of pottery, beads and animal bones. The most important shaft grave to be found was at the molossian cemetery of Liatovouni in Konitsa (note 6). The only prehistoric burial (grave 59, fig. 2) belonged to a man who, as the burial gifts indicate, was a “warrior”. The offerings in question were a bronze sword and a dagger, two bronze spearheads, eleven bronze bosses and twenty eight smaller bronze buttons, coming from a leather corselet or breastplate, also two rock crystal beads. The grave has been dated as belonging to the 12th century BC or to the Late Helladic IIIC period. Other pit burials were found at Kato Konitsa in Ioannina (with a matt-painted kantharos, a bronze sword and a bronze spearhead) and at Pedini in Ioannina (with a Mycenaean bowl, a bronze dagger, a bronze spearhead, a bronze knife and a clay spindle whorl). Another pit grave was uncovered at Paramythia in Thesprotia (with a bronze dagger and a bronze spearhead) and at Grika in Thesprotia (finds included a small vase, a bronze spearhead, a clay bead and a gold bead, bones of a horse). The only tholos tomb of Epirus (fig. 3) at Kiperi in Parga (note 7) is a direct example of an imported Mycenaean burial custom. The tomb is constructed meticulously with small flat stones, each one jutting out to support the structure above. The tholos measures approximately 3.7-3.9 m in diameter, its original height is calculated to have been the same, while the tomb’s road measures 4 m long and approximately 1 m wide. The floor both of the burial chamber and the road leading to it are paved with sea pebbles. In the burial chamber, which has been looted, bones from various burials were found, as well as the skeleton of a woman near childbirth. Also, a bronze spearhead was found, sherds of both Mycenaean wheelmade and local handmade pottery. The tomb is dated from the Late Helladic IIIA-B period. Three burial mounds were excavated at the Mycenaean citadel of Ephyra (note 8). These measured 9-13.5 m in diameter, their stone ring was 1-1.5 m wide and their height as it stands today was approximately 0,3 m. Burial tumulus A (Late Helladic IIIC period) contained removed human bones, secondarily placed in a depression of the rock, also three pit burials of adults, whose burial gifts consisted of handmade pottery, spindle whorls and a bronze pin. Tumulus B contained one adult burial with no burial offerings. Tumulus C (Late Helladic IIIA-C period) contained a small cist grave with an infant burial without offerings, a built tomb with an adult burial, below which there was an ossuary, containing bones of thirteen secondary burials, all mixed together with sherds of handmade and Mycenaean pottery, spindle whorls made of various materials and other objects. Nearby, an adult’s pit burial was found, as well as a second child burial and a third one of a woman with a child. Charred earth is mentioned to have been found under the woman’s head, suggesting cleansing by fire. During the Bronze Age the pottery produced locally in Epirus remained handmade. Small differences in manufacturing and firing techniques are of no assistance in the dating of pottery, while the few stratification data are not supported by the additional evidence supplied by imported objects. Certainly, the raw material used, must have come from local clay deposits. Basic recognized production techniques are that of the “coiling” technique, used for manufacturing storage vessels, while the “pinching” technique seems to have been used for table ware. Pit-kilns, like the one found at Dodona, must have been used for the firing of vases. These would have been technologically adequate for the firing of handmade pottery, where control of the temperature would have been minimal with corresponding results. This tradition lasted for several centuries in Epirus. With few exceptions, importation of the potter’s wheel and advanced thermal constructions are noted only from the 4th century BC on (note 9). The handmade pottery of Epirus was first divided into four basic categories by S. Dakaris, based on evidence coming from Kastritsa in the Ioannina basin. This classification is still, broadly speaking, in use with only a few methodological improvements having been made to it (note 10). The most common type of pottery (group II according to Dakaris) is that of coarse-fabric domestic ware with plastic decoration in the form of rope bands or knobs of clay. This pottery served everyday needs of storage, preparation and consumption of food. It is distinguished by its non-plastic inclusions, bad firing conditions and coarse surfaces with no polishing. These vases mainly come in the shape of pithoid jars and smaller cups (fig. 4). It is produced at least from the Neolithic or Chalcolithic period (Doliana in Ioannina) and remains in use all through the Bronze Age down to the Late Classical period and even beyond. Second (group III according to Dakaris) comes coarse and semi-coarse table ware, having polished surfaces in dark colours, often combined with the plastic decoration of the previously mentioned group. This table ware pottery has predominantly open shapes to demonstrate (cups, bowls, saucers, fig. 5). It is manufactured of purer clay and is fired under better conditions. It belongs to the pottery tradition (minyan and pseudo-minyan pottery) of the Middle Bronze Age, as it also evolved in neighbouring Albania. This type of pottery survives up to the Early Iron Age (approximately down to the 7th century BC). Handmade pottery with matt-painted decoration (Macedonian/Albanian matt-painted) forms group IV according to Dakaris and can safely be classified as being part of the Middle Bronze Age tradition. The first phase (1200-900BC) of “northwestern” matt-painted pottery (note 11) is distinguished by placing the black pigment over the ceramic surface before firing,which leads to an excellent result. There are only two intact vases-kantharoi known to exist in Epirus (coming from graves at Kato Pedina, fig.6, and at Kato Konitsa in Ioannina), while a few sherds are mentioned as having been found at Vitsa, Krya, Kastritsa, Koutselio and Dodona in the Ioannina district. The second phase (850-700 BC) features vases, whose decoration is brittle, as it is set after firing. There are many samples of this pottery, coming from the Pogoni tumuli and the molossian cemeteries of Liatovouni and Vitsa. 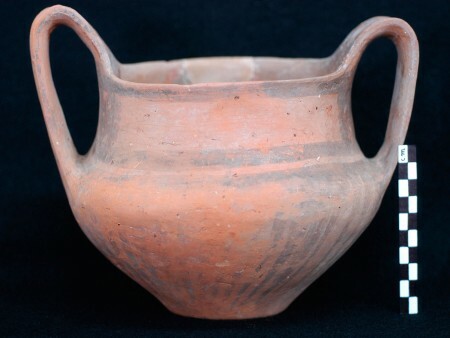 It is an important coincidence that at the Mavromantilia site in Thesprotia (note 12), coarse handmade pottery was found together with matt-painted sherds and also with wheelmade geometric pottery from southern Greece. 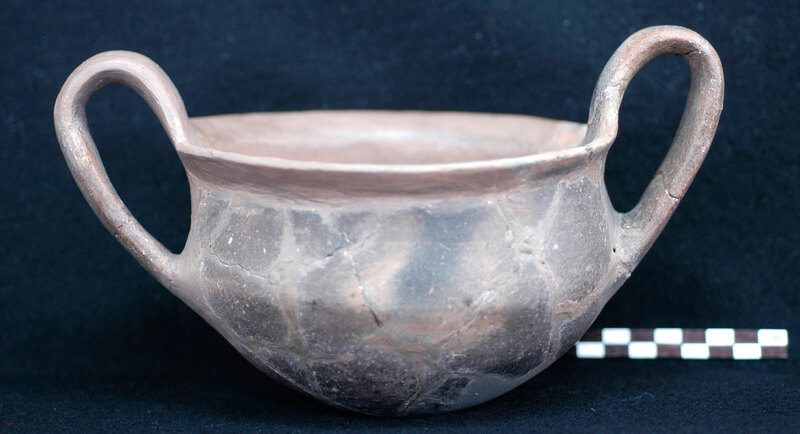 Also, the stem of a Mycenaean kylix and handles of the “wish-bone” type are mentioned to have been found here. “Orange-red ware” includes both handmade and wheelmade pottery. The surface of the vessels is similar to those of the matt-painted group, although often it has an ash-grey core. 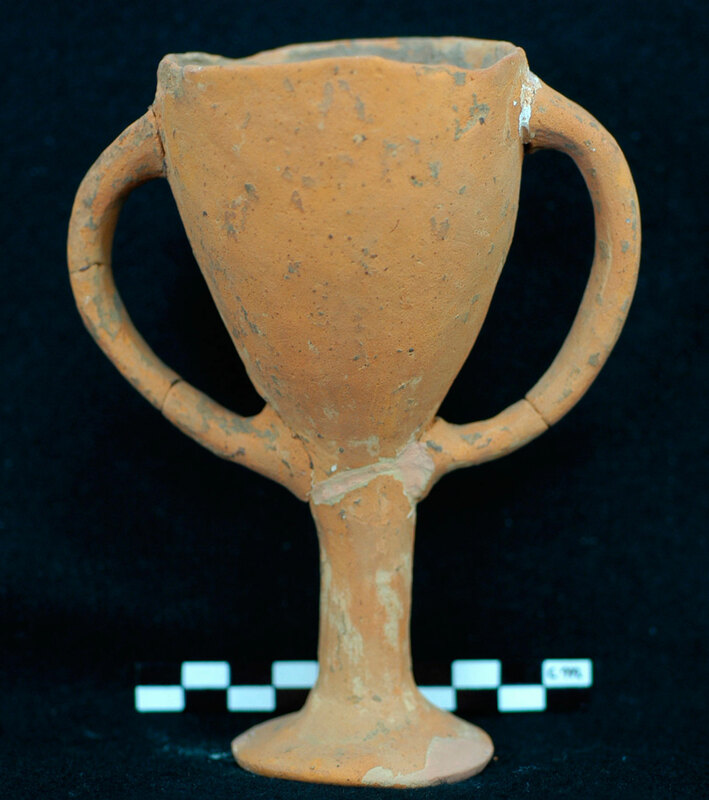 This category could be one and the same, as that of local handmade imitations of Mycenaean pottery, almost exclusively consisting of stemmed kylikes (fig. 7). 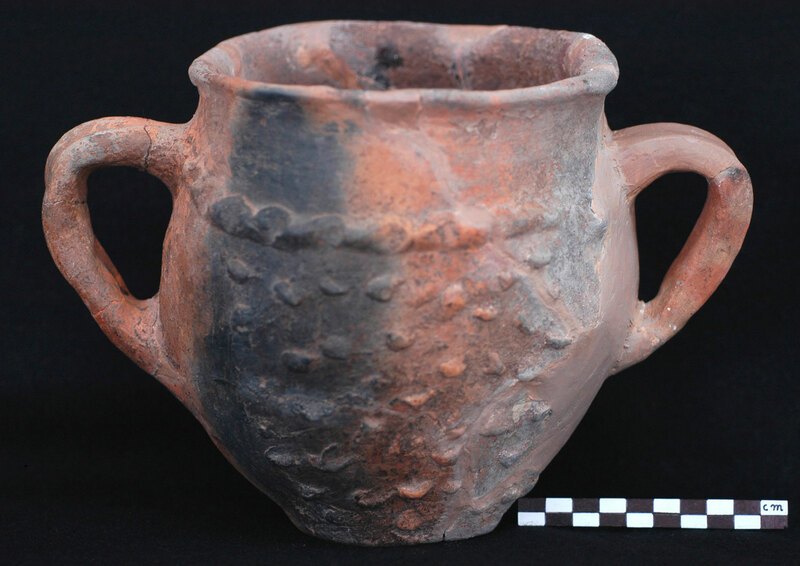 Known examples of this type of vessel are mentioned as being found at Krya, Kastritsa and Dodona in the Ioannina district, some of which have brittle matt-painted decoration. The predominant view today is that this particular class of pottery made its appearance around 1000 BC. Οnly a few intact vessels remain in existence as examples of imported wheelmade Mycenaean pottery, as well as many sherds coming from various sites (Liatovouni, Mazaraki, Krya, Kastritsa, Pedini, Dodona, Grika, Kiperi, Ephyra, Skafidaki). Such pottery probably originated from regional production centres of the Mycenaean world. Chronologically, this pottery belongs to Late Helladic III (mainly B-C period). The only statistic study (note 13) made for categories of prehistoric pottery in Epirus was carried out on pottery from Dodona. Main categories (II and III according to Dakaris) represent 80%, two hundred sherds of Mycenaean pottery represent 5% (the equivalent percentage of sherds of this type in Ephyra is calculated as 10-15% approximately), three hundred or more sherds of “orange-red ware” pottery stand for approximately 15% of the total, while a few sherds of matt-painted pottery were also included. The study of the prehistoric pottery of Epirus is still in its early stages. 1. In the bibliography pertaining to prehistoric Epirus the existence of some cist graves is mostly unfounded, based on oral tradition or on the evidence presented by handmade pottery, which however survives chronologically until late antiquity in Epirus, or on other characteristic finds (bronze weapons from Anthohori, Areti, Mesogefyra and Zaravina in the district of Ioannina). The discovery of a Mycenaean grave at Kanallaki in Preveza was announced by the 33rd Ephorate of Prehistoric and Classical Antiquities. 2. Ι. Βοκοτοπούλου, «Νέοι κιβωτιόσχημοι τάφοι της ΥΕ ΙΙΙΒ-Γ περιόδου εξ Ηπείρου», Αρχαιολογική Εφημερίς 108 (1969), p. 179-191, pl. 23-26. 3. Σ. Δάκαρης, «Προϊστορικοί τάφοι παρά το Καλμπάκι Ιωαννίνων», Αρχαιολογική Εφημερίς 95 (1956), p. 114-153. The graves were uncovered inside the local army camp and the finds were delivered. 4. Βοκοτοπούλου, op.cit., p. 191-203, pl. 27-30. Two more graves are mentioned as existing nearby. 5. Ι. Ανδρέου, «Κιβωτιόσχημος τάφος στο Ρωμανό Ιωαννίνων», Αρχαιολογικά Ανάλεκτα εξ Αθηνών 10 (1977), p. 168-174. Many graves belonging to different eras are mentioned as existing at Romano. 6. 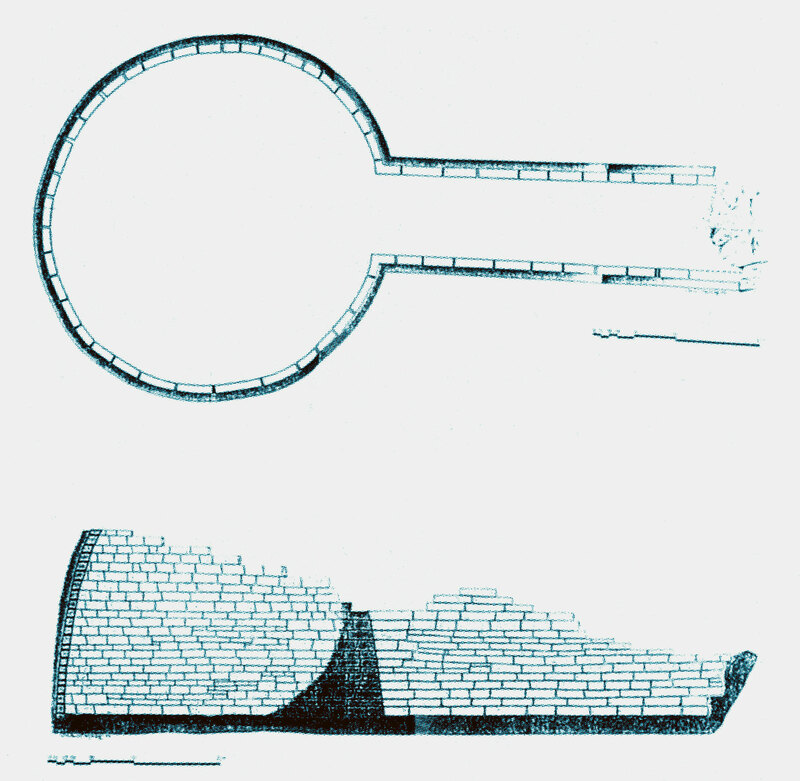 A. Douzougli / J. Papadopoulos, «Liatovouni: A molossian cemetery and settlement in Epirus», Jahrbuch des Deutschen Archäologischen Instituts 125 (2010), p. 23-35, 68-71. The 103 graves in the cemetery span a period of time lasting up to the 4th century BC, parallel to the existence of the neighbouring settlement. 7. A. Papadopoulos, «Das mykenische Kuppelgrab von Kiperi bei Parga (Epirus)», Mitteilungen des Deutschen Archäologischen Instituts, Athenische Abteilung 96 (1981), p. 7-24. The tomb presents similarities of construction and typology with similar ones in the neighbouring district of Aitoloakarnania. 8. A. Papadopoulos, «Tombs and burial customs in Late Bronze Age Epirus», in R. Laffineur (ed. ), Thanatos: Les coutoumes funéraires en Egee à l’Age du Bronze, Liège 21-23 Avril 1986, Liège 1987, p. 139-142, pl. 38-39. Nearby, two infant pithos burials were uncovered, dating to the Early Iron Age. 9. Σ. Δάκαρης, «Ανασκαφή εις Καστρίτσαν Ιωαννίνων», Πρακτικά της εν Αθήναις Αρχαιολογικής Εταιρείας 106 (1951), p. 177-183 and Σ. Δάκαρης, «Ανασκαφή εις Καστρίτσαν Ιωαννίνων», Πρακτικά της εν Αθήναις Αρχαιολογικής Εταιρείας 107 (1952), p. 368-381. See also T. Tartaron, Bronze Age Landscape and Society in southern Epirus, Greece», British Archaeological Reports, International Series 1290 (2004), p. 71-93, on appearance and shape, production and firing, provenance, dating and social implications. 10. The 4th century BC was of revolutionary importance to Epirus, seeing that inhabitants then started to get organized socially, politically and economically, faced with the arrival on the scene of Philip II of Macedonia. Until then, they had inhabited unfortified hamlets in seasonal huts built of perishable materials. Their economy and subsistence in general was that of a community of farmers and shepherds. This is when the urbanization of the countryside began, not taking into account previous efforts made by colonists from Elis and Corinth in southwestern Epirus. 11. For chronological distinction into phases and general debate on the topic see the exemplary publication by Ι. Βοκοτοπούλου, Βίτσα: Τα νεκροταφεία μιας μολοσσικής κώμης, Athens 1986, p. 255-276. 12. Α. Τζωρτζάτου / Γ. Φάτσιου, «Νέα στοιχεία για τη Θεσπρωτία των γεωμετρικών και αρχαϊκών χρόνων», Ηπειρωτικά Χρονικά 40 (2006), p. 63-67, 85-86. 13. K. Wardle, «Cultural groups of the Late Bronze and Early Iron Age in north west Greece», Godišnjak 15 (1977), p. 176-187. Ανδρέου Ι., «Κιβωτιόσχημος τάφος στο Ρωμανό Ιωαννίνων», Αρχαιολογικά Ανάλεκτα εξ Αθηνών 10 (1977), p. 168-174. Βοκοτοπούλου Ι., «Νέοι κιβωτιόσχημοι τάφοι της ΥΕ ΙΙΙΒ-Γ περιόδου εξ Ηπείρου», Αρχαιολογική Εφημερίς 108 (1969), p. 179-207. Βοκοτοπούλου Ι., Βίτσα: Τα νεκροταφεία μιας μολοσσικής κώμης, Athens 1986. Δάκαρης Σ., «Ανασκαφή εις Καστρίτσαν Ιωαννίνων», Πρακτικά της εν Αθήναις Αρχαιολογικής Εταιρείας 106 (1951), p. 173-183. Δάκαρης Σ., «Ανασκαφή εις Καστρίτσαν Ιωαννίνων», Πρακτικά της εν Αθήναις Αρχαιολογικής Εταιρείας 107 (1952), p. 362-386. Δάκαρης Σ., «Προϊστορικοί τάφοι παρά το Καλμπάκι Ιωαννίνων», Αρχαιολογική Εφημερίς 95 (1956), p. 114-153. Papadopoulos A., «Das mykenische Kuppelgrab von Kiperi bei Parga (Epirus)», Mitteilungen des Deutschen Archäologischen Instituts, Athenische Abteilung 96 (1981), p. 7-24. Papadopoulos A., «Tombs and burial customs in Late Bronze Age Epirus», in R. Laffineur (ed. ), Thanatos: Les coutoumes funéraires en Egee à l’Age du Bronze, Liège 21-23 Avril 1986, Liège 1987, p. 137-142. Τζωρτζάτου Α. / Φάτσιου Γ., «Νέα στοιχεία για τη Θεσπρωτία των γεωμετρικών και αρχαϊκών χρόνων», Ηπειρωτικά Χρονικά 40 (2006), p. 61-90. Wardle K., «Cultural groups of the Late Bronze and Early Iron Age in north west Greece», Godišnjak 15 (1977), p. 153-199.